The prayers in the book, Praying Through the New Testament sound like Scripture because they are formed from Scripture. In your home, as you walk from room to room and from task to task, you might often breathe a short prayer to God. Probably your prayers jump from person to person as they come to mind, and from need to need. You might burst into a song of praise. in this book are similar to this. These Scripture-based prayers are not the only way to pray, but they are a wonderful way to pray—an effective way to pray Scripture into the lives of others. 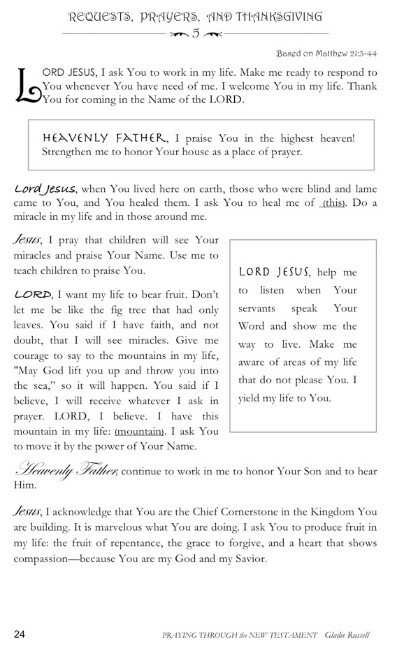 I have found this way to pray especially helpful when praying for family members and others for whom I pray on a regular basis. But then, I pray this way for people I don’t even know. Scripture-based prayers can put into words the deep desires we carry in our heart for others. Pray them with thanksgiving in your heart, and watch to see what God does—not only in you, but also in others. Join me on this Adventurous Prayer Journey as we Pray Through the New Testament.